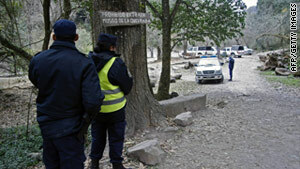 Police officers on Saturday stand at the entrance to a hiking trail where two French tourists were killed in Salta, Argentina. (CNN) -- Authorities in Argentina have arrested a second suspect in the case of two French tourists found dead near a hiking trail last week, police said on Tuesday. They did not name the suspect in a short statement, which made no mention of a possible motive in the murders. The state-run Telam news agency reported that the suspect is accused of having something to do with the weapon used to kill the two tourists. Authorities arrested a first suspect in the case on Monday. He was subsequently released because of a lack of evidence, the agency said. Other tourists found the bodies of the two female victims, who were 23 and 29 years old, Telam reported. They were last seen in the hostel where they were staying on July 16. The women were "viciously" killed, one shot in the head and the other in the back, the agency said, citing Marcelo Baez, a spokesman for the judicial authority in Salta province. Baez said authorities suspect they could have been held for several days before being killed. Their bodies were found Friday, the Salta government said in a statement. Evidence indicates one of the victims was sexually assaulted, Telam said, citing police sources. Their bodies were found in the area of the San Lorenzo ravine in northern Argentina.